Church architecture has joined the disputed issues of contemporary Western Catholicism. Indeed, one commentator, the American Michael Rose, does not scruple to speak about “architectural culture wars” in progress today.1 That the same author can vary that phrase by introducing, in place of “architectural,” the neologism “archi-liturgical” should alert us to a fairly obvious fact.2 The debate about architecture is as organically connected with dispute about the liturgy as a Modernist church in the twentieth-century International style is disconnected from the traditional modalities of Catholic worship. The “ideological impasse in which modern church architecture sleeps” could be overcome with no compromise of liturgical principle if Comper’s understanding not only of the “indispensability of beauty” but, more specifically, of the “legacy of Christian tradition” were renewed.9 If I say that the overall effect of text and photographs in this book comes as a revelation, I shall also be declaring an interest. What follows in this essay is an attempt to second Father Symondson’s plea, notably by bringing into consort some voices harmonious with his, mainly—but not exclusively—from the United States. The ground of my partisanship lies in the history of the subject—namely, sacred space as envisaged in Church tradition. Any visit to that history, with a view to drawing out pertinent principles, will prove hard to reconcile with those radically innovatory twentieth-century buildings that reject both structure and content as found in pre-twentieth-century use. Writing as an Anglo-Catholic with Rome-ward inclinations,11 Comper comes obligingly to our aid. His prose has late Edwardian lushness, but the saturated quality of this particular passage turns on its richness of allusion to the Bible and Tradition. Comper goes on to emphasize the catholic—that is, the ecclesial and cosmic—character of the church building, to the point of arguing that “a Protestant church” (as distinct from meeting-house for preaching) is a contradiction in terms. Only a high doctrine of the ecclesial mystery can explain the existence of the historic church building of traditional Christendom and the attention paid it by the community. In his keynote essay “Of the Atmosphere of a Church,” from which I have been quoting, Comper infers from such a conception that “it must . . . reduce to folly” the terms “self-expression” and “the expression of the age,” and most notably so when they are “used to cover such incapacity and ugliness as every age has in turn rejected.” And he inquires, pointedly, “Is there such a supremacy of goodness, beauty and truth in the present age as to mark it as distinct from the past and demand that we invent a new expression of it?”14 A saint or mystic may pass directly to God without any need for the outward beauties of art, or nature for that matter. Most people cannot. Comper stresses the eschatological setting of worship. It would be hard to imagine a manifesto in more brutal contradiction to Comper’s principles than the United States Bishops’ Conference Committee on the Liturgy document Environment and Art in Catholic Worship, produced exactly thirty years after he wrote. The 1978 text declared the assembly of believers the most important “symbol with which the liturgy deals.” The document thus relegates all other elements of Catholic worship—not only the ordained ministry but the rites themselves, and so, inevitably, their artistic and architectural elaboration—to a secondary status.17 In due course, this text stimulated a robust counterreaction in the American church. Thus, for instance, the liturgical theologian Francis Mannion found behind its extraordinary choice of controlling option an attitude he called theological “experiential-expressivism.” That is his term for a situation where liturgical forms serve chiefly to express the inspirations of a group. The role of art in exploring, after the manner (we might add) of Comper, the “Christologically founded rites” of the Church’s “sacramental order” can only have the most precarious future, so Mannion opined, if such a view of the Church’s worship should come to prevail. The most frequent visual embodiment of “experiential-expressivism,” at least in North America, is probably the domestication of church interiors. The only “model” appeal to group self-expression one can readily find in the paradigm of contemporary Western culture turns out to be the living room or, more institutionally, the doctor’s waiting room or, yet again, the hotel foyer. Comfortable or plush, these have it in common that they are always tame. Such accommodation to secular space is hardly unknown in Britain either. In the words of one English commentator (like Comper, an Anglo-Catholic, at least at the time of writing): “The sanctuary became less a place to worship God than the apotheosis of 1960’s man’s homage to G-Plan furnishing and his own immanence.”18 Mannion’s critique was equally severe, if more soberly expressed. That is the artifice of understatement. 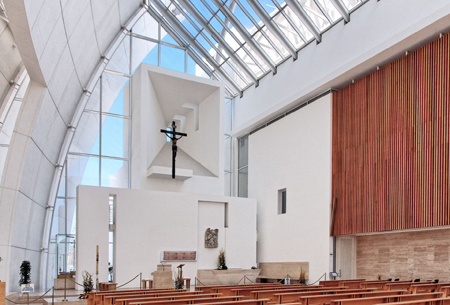 How can they possibly be reconciled if architectural Modernism seeks, as it does, to expunge symbolism and memory whereas the sacramental sensibility of Catholicism is founded on precisely these things? Helpfully, Mannion points for guidance to the post-Conciliar rite for the dedication of a church and altar and the relevant sections of the 1992 Catechism of the Catholic Church.21 Given the Second Vatican Council’s movement of ressourcement in matters of early Christian Liturgy, it was certainly extraordinary that the bishops and the pert expressed so little interest in the recovery of the forms of ancient Christian architecture and art, forms which are the matrix of all the subsequently developed styles the Church has known. In the post-Conciliar period, some assistance was granted, however, to the recovery of sanity by these ceremonial and catechetical documents. In the year 2000 the National Conference of Catholic Bishops in the United States approved a replacement set of guidelines for Environment and Art in Catholic Worship. Built of Living Stones, for such was its title, represents a considerable advance on its predecessor. It does so by conceiving the church building as chiefly a function of the Church’s rites. But there is a price to be paid in terms of devotional purposes, as distinct from liturgical goals strictly so defined.22 For the document did not do justice to a swinging—but not wholly unjustified—judgment passed by the Swiss dogmatician Hans Urs von Balthasar on how we live now. For Schloeder, in striking contrast, the church building is an icon of the spiritual reality of the Church.28 Here he has, I believe, rightly identified the nodal issue. Schloeder outlines briefly how in the East and West this “iconic” character of the church building worked out. Given the authoritative role of Church tradition in these matters, this is in fact an indispensable exercise. Turning now to the West, such high medieval treatises as the canon regular Hugh of Saint Victor’s Speculum de mysteriis Ecclesiae, the black monk Abbot Suger’s Libellus de consecratione Ecclesiae sancta Dionysii, and Bishop William Durandus’s Rationale divinorum officiorum furnish an analogical treatment to that found further east. The themes of the Body of Christ and the Heavenly City bespeak divine order in its integrity and fullness, which buildings shaped for the celebration of the liturgy should reflect. That could not but ratify patristic (and post-patristic) theological symbolism—not least for Borromini. Schloeder’s exposition itself indicates that the tradition of symbolic interpretation was not uniform. It had variants, stemming from differences in both architectural style and theological background. 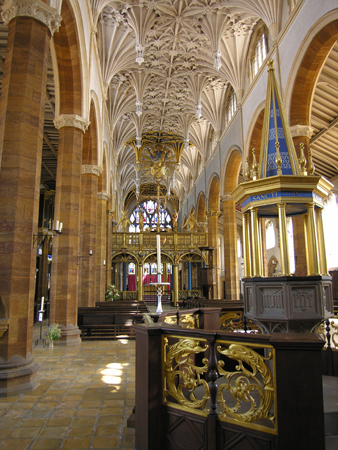 Comper had increasingly sought to maximize the advantages of such pluralism by a policy of “unity by inclusion”: Gothic and Classical styles, for instance, are not, in Christian use, opposites.39 Enough is in common to call this, in broad terms, the Tradition (of iconic interpretation of architecture, q.v.). It is a tradition which requires reinstatement in our own time, above all through the construction of buildings that actually call for a reading along some such lines. Indeed, the post-Conciliar rite Dedication of a Church and an Altar demands it, explicitly calling the church building a representation of the heavenly Jerusalem.40 If that rite bears any authority, then the shapes and volumes of sacred space need relating to ecclesial functions within an organic composition, and both massing and decoration must be allowed to recover their full symbolic valency. This in turn will permit the personal, devotional inhabiting of space as well as its corporate liturgical equivalent. Three years previously, in the unlikely context of the London Tablet, the stained–glass artist Patrick Reyntiens had entered a similar plea. That was Comper’s message too, but in his case it came to entail a comprehensive openness to all the great stylistic epochs of the Church as builder. That was possible owing to both the ontological character of beauty as a transcendental determination of being and the fundamental internal coherence or organicity of the Church’s tradition. The unifying element in any particular building comes from the architect’s contribution. A church must be not only a rationally designed liturgical space but a unified work of art. John Henry Newman, in the nineteenth of the Parochial and Plain Sermons (volume six), took as his text Psalm 78:69, which in the Authorized Version reads, “He built His sanctuary like high palaces, like the earth which He hath established for ever.” Newman used the homiletic opportunity to argue against the opinion that Jesus’s prediction to the Woman of Samaria—future worshippers “shall worship the Father in spirit and in truth” (John 4:23)—nullifies the psalm in question (and in so doing renders trivial the topic of this essay). Reverend Aidan Nichols, O.P. is the prior of the Dominican Priory of Saint Michael the Archangel, Cambridge, and a prolific theologian. He is a scholar of the theologian Hans Urs von Balthasar and of the Russian theological tradition, among other schools of thought. The above article is an excerpt from Lost in Wonder: Essays on Liturgy and the Arts, by Aidan Nichols, O.P., printed in 2011 by Ashgate Publishing Company. Reprinted with permission. 1. M. S. Rose, In Tiers of Glory. The Organic Development of Catholic Church Architecture through the Ages (Cincinnati: Mesa Folio Editions, 2004), 109. 3. B. Ennis, “A Vacuum in the Spirit. 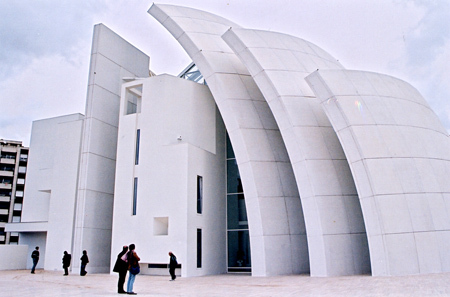 The Design of the Jubilee Church in Rome,” Sacred Architecture 9 (2004): 10–13. 4. Cited in Rose, In Tiers of Glory, 103–104. 5. D. Watkin, Morality and Architecture (Oxford: Clarendon Press, 1977); Watkin, Morality and Architecture Revisited (London: John Murray, 2001). 6. A. Symondson, S.J., and S.A. Bucknall, Sir Ninian Comper. An Introduction to His Life and Work, with Complete Gazetteer (Reading: Spire Books, 2006). Mr. Bucknall’s contribution took the form of the Gazetteer. 10. V. Shevzov, Russian Orthodoxy on the Eve of Revolution (New York: Oxford University Press, 2004), 69–70. 11. Symondson and Bucknall, Sir Ninian Comper, 186. 12. J. N. Comper, Of the Atmosphere of a Church (London: Sheldon Press, 1947), 8. This essay is conveniently reprinted in Symdonson and Bucknall, Sir Ninian Comper, 231–246. 17. M. F. Mannion, “Beyond Environment and Art in Catholic Worship,” Antiphon 4:2 (1999): 2–4, 7, and here at p. 2. An expanded version appeared as “Towards a New Era in Liturgical Architecture,” in Mannion, Masterworks of God: Essays in Liturgical Theory and Practice (Chicago: Hillenbrand, 2004), 144–175. 18. R. Low, “Go East, Young Man,” New Directions (2001), 17–19, and at p. 17 in Aidan Nichols, O.P., Lost in Wonder: Essays on Liturgy and the Arts. 19. Mannion, “Beyond Environment and Art,” 4. 21. Catechism of the Catholic Church, nos. 1179–1186, 1197–1199, 1667–1770. 22. Thus T. V. Vaverek, “The Church Building and Participation in the Paschal Mystery: Assessing the NCCB Document Built of Living Stones,” Sacred Architecture 5 (2001): 10-15. 23. Cited from Balthasar’s essay “Unmodern Prayer” in D. Stancliffe, [review of] Richard S. Vosko, God’s House in our House; Re-imagining the Environment for Worship (Collegeville, MN: Liturgical Press, 2006), in Art and Christianity 48 (2006): 14. 24. Dating from the years 1928–1930, its creator, Rudolf Schwarz, a friend both of the father of architectural Modernism Ludwig Mies van der Rohe and of the theologian Romano Guardini, sought to provide a theological interpretation of his otherwise symbolically minimalist churches (relating different ground plans for them to Christ’s preexistence, life, Passion and Parousia) but did so in an idiosyncratic, and possibly heterodox, fashion quite unrelated to the previous history of Catholic church architecture: see S. J. Schloeder, Architecture in Communion: Implementing the Second Vatican Council through Liturgy and Architecture (San Francisco: Ignatius, 1998), 234–238. Schwarz’s manifesto, Vom Bau der Kirche (Heidelberg: L. Schneider, 1947, 2nd edition) was translated into English as The Church Incarnate. The Sacred Function of Christian Architecture (Chicago: H. Regnery, 1958). A benign interpretation is found in W. Zahner, Rudolf Schwarz: Baumeister der neuen Gemeinde. Ein Beitrag zum Gespräch zwischen Liturgietheologie und Architektur in der liturgischen Bewegung (Altenberge: Oros, 1992). Cooler is T. Hasler, Architektur als Ausdruck—Rudolf Schwarz (Zurich: GTA/Berlin: Gebr. Mann, 2000). 26. S. J. Schloeder, “What Happened to Church Architecture?,” Second Spring (March 1995): 27–38 and at p. 29 in Aidan Nichols, O.P., Lost in Wonder: Essays on Liturgy and the Arts. 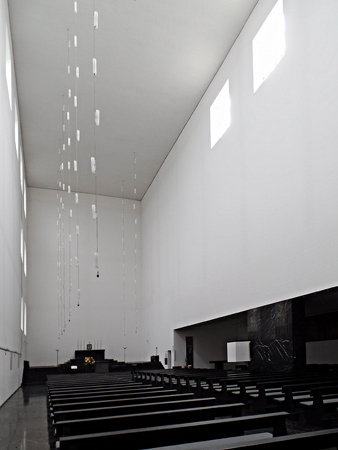 Schloeder’s criticisms, as well as his positive proposals, were set out at much greater length three years later in his Architecture in Communion. See note 24 above. 27. R. K. Seasoltz, The House of God (New York: Herder and Herder, 1963), 125–126. 29. Schloeder, “What Happened to Church Architecture?,” 30. 31. Ibid., 31: an encapsulation of Mystagogia, chapters 2, 4, and 8. See G. C. Berthold, trans., Maximus Confessor: Selected Writings (London, SPCK, 1985), 188–190, 198. As Berthold explains in a note, “the term mystagogy signifies a liturgical contemplation of the mystery of the Church” understood as “new creation in Christ” (p. 214). That is precisely why Maximus cannot avoid discussing the church building. 32. Schloeder, “What Happened to Church Architecture?,” 32. Schloeder subsequently inserted this passage into a description of the ideal “house of God”—implied, he holds, by a combination of the main ecclesiological concepts and images of Lumen gentium, the Second Vatican Council’s Dogmatic Constitution on the Church. Thus, Schloeder, Architecture in Communion, 30. 33. Schloeder, Architecture in Communion, 12. 35. M. Marinelli, ed., Instructionum fabricate et supellectilis ecclesiasticae libri II Caroli Borromeo (Vatican City: Libreria Editrice Vaticana, 2000), 4. 36. 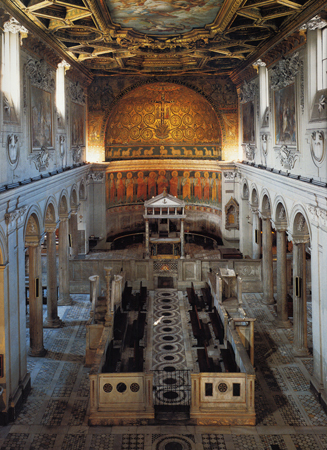 M. E. Gallagos, “Charles Borromeo and Catholic Tradition regarding the Design of Catholic Churches,” Sacred Architecture 9 (2004): 14–18. 37. Sacrosanct con cilium, no. 23. 38. A. Reid, The Organic Development of the Liturgy (Farnborough: St. Michael’s Press, 2004). 39. Symondson and Bucknall, Sir Ninian Comper, 105–112. Compare Quinlan Terry’s remark that “Gothic and Classical are not opposed to each other like modern and traditional construction . . . in many ways [Gothic] is one of the many interesting digressions within the classical tradition”: thus Q. Terry, “The Survival of Classicism,” Sacred Architecture 12 (2006): 16–19, and here at p. 19. 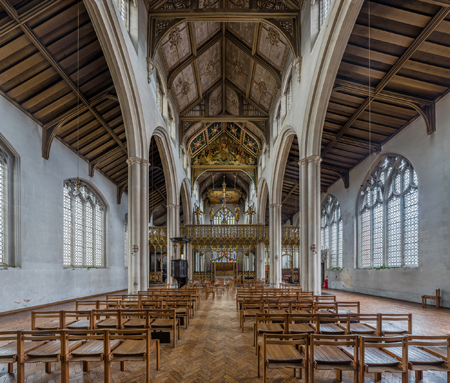 Terry, whose Catholic masterwork is the rebuilt cathedral at Brentwood, implies that the advent of Modernism shows up A. W. N. Pugin’s mistake in taking for granted such contrariety. 40. Dedication of a Church and an Altar, I. 1. 41. Mannion, “Beyond Environment and Art,” 7. 42. P. Reyntiens, “All Distraction and Half-Truths,” The Tablet, June 1, 1996, 731. 43. Cited from R. Adams Cram, Church Building: A Study of the Principles of Architecture in Relation to the Church (Boston, MA: Small, Maynard, and Co., 1901), in Rose, In Tiers of Glory, 91. 44. J. H. Newman, Parochial and Plain Sermons, vol. 6 (London: Rivingtons, 1881), 271. 47. One Comper church, All Saints, London Colney (Hertfordshire), came by purchase into Catholic hands in 1974. If not by then at any rate soon after Catholics had unfortunately forgotten how to use such a church. On my own visit, I found that, despite Comper’s provision of a high altar enjoying total visibility from all parts of the building, a table had been erected for Mass at its west end, thus ensuring that the worshippers (except for the celebrant) turned their backs throughout the liturgy on sanctuary, altar, civory, and the great east window with its typical Comper Majestas of the eternally youthful Christ.